Ever thought that mango is great in a Christmas fruitcake? 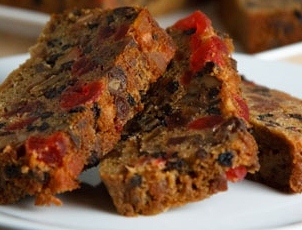 And for sure – the recipe you are using rum does say to use just a little bit of rum…Here is one of my favourite recipes – and what would Christmas baking efforts be without a real fruitcake? This one is full of fruits and nuts and is sweet and moist….. real treat! Especially if you serve it with French Vanilla Ice Cream or real whipping cream (just forget the calories for once – this one is worth it! Please send in your comments, suggestions and experiences, your input is always welcomed and very much appreciated! The recipe sounds so good I am preparing to make it. One question: It’s a bit unclear how much rum is used. When you soak the fruit in the 1/4 cup of rum, will there be any rum remaining to be used after it’s baked? Hello Anna! Thanks so much for your message – you will notice that the 1/4 cup of rum is in the recipe twice – once to soak the fruit and second time to add to the cake. Happy baking – I am sure you will love the result!